South Bandung is popular for its ecotourism spots. The beauties of nature in the area can not only be seen from the lush green trees, but in the Ciwidey District visitors can enjoy the warm water from hot springs in the foothills of Mount Patuha. One of the popular local hot springs is located in the Cimanggu area, which provides all-year round hot water. greenish color, which is the original color of the water from its source at the Mount Patuha foothills, and is considered good for health. 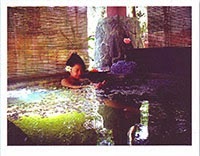 The Cimanggu hot spring is specifically located in Rancabali Village, Ciwidey District South Bandung. The Cimanggu hot springs facility is divided into two parts. One is dedicated for the general visitors, and another one is a VIP facility, which provides bathtubs for visitors to soak and privately enjoy the warm water. The VIP room is part of the facility provided by the Cottage Meranti 1 and 2 for those wishing to stay overnight. Bak Rendam (Bathtub) Kadaka bathtub facility with a fee of IDR. 20,000 per person. There’s also a more private closed-door facility with a two person capacity bathtub. area, children playground, hot water swimming pool, shops selling food and beverages, prayer room, and an outbound training facility. People come not only during the day time, but also during the night,. Entrance fee to enter the Cimanggu area is IDR 15,000 per person during the weekend, and only IDR 13,000 during weekdays. For those wishing to stay overnight, there are a number of cottages equipped with private bathtub, with a price range of IDR 450,000 to IDR 1,350,000 per night.